3D Printing and 3D Scanning in the field in Uganda makes prosthetics more available to those in need. An organization is using technology to make resources more accessible to amputees in developing countries. 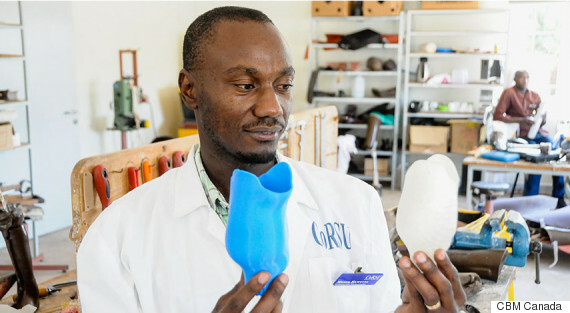 Christian Blind Mission, an NGO in Canada that helps people with disabilities in developing countries, is working with researchers from the University of Toronto to use 3-D printing to produce prosthetic sockets in Uganda. The project, 3-D PrintAbility, aims to make high-quality prosthetics more affordable in a country with a shortage of technicians who can make the artificial sockets. Recently, the team completed a trip to Uganda where they successfully trained five orthopedic technicians to operate the technology. The group was also able to fit a 4-year-old child with a functioning prosthetic socket and leg set, Mitch Wilkie, the director of International Programs for CBM, told The Huffington Post in email. In Uganda, the process to obtain a prosthetic after an amputation is a long one, and often not reliable. The program’s 3-D scanning technology, can make a more accurate, better-fitting model for the artificial limb than a skilled technician could, according to the Washington Post. Professor Matt Rato from the University of Toronto, the principal investigator for the project, told The East African that the entire process will take only about one to two days. Furthermore, the 3-D printing and scanning won’t require extensive training to operate, and could hopefully get more people involved with creating prosthetics. “Our solution does away with that particular skill set and potentially makes it possible for people with less expertise to produce well-fitting prosthetics,” Rato told Global News. While it currently takes $5,000 to produce a prosthetic in developing countries, the group is hoping that 3-D printing and scanning will allow them to produce artificial limbs for about $250, according to Sci Dev Net. CBM will launch its first program at Uganda’s CoRSU Hospital. The organization has been recognized by the Canadian government for its innovative work, and was awarded a $100,000 grant last year to further its research, according to the Stouffville Sun-Tribune. The group is now moving on to the clinical trial phase of their program, where they will take on 35 patients who will test their technology over the course of six months, Wilkies told HuffPost.